May Day (Pervomay) is traditionally celebrated in Russia and beyond with flowers, songs and happy outings. Early video of May Day celebrations in Russia: #Vladivostok and #Khabarovsk (the Far East) mass parades on video. #Moscow has several different parades and rallies – early footage from the Red Square rally. Sorry I have to talk about gruesome subjects such as #Chernobyl, #falseflags and #Donbass war in #Ukraine on a day like this. But it is today’s reality and it’s important for humanity to open our eyes and see the truth – so we can move forward. As you will also see below, historically, May Day and Chernobyl have become intrinsically connected. FREE Earth Shift Report 4: MAY DAY or CHERNOBYL 2.0? Does Chernobyl fire threaten a new nuclear disaster? Who’s behind it? Who will be affected most? What really happened in 1986? False flags and other news from Ukraine. New warnings and predictions. According to the official Kiev, the raging forest fire in the Chernobyl exclusion zone has been localized by Ukrainian firemen. Kiev admits to the fire continuing full force over the area of 70 hectares, with additional areas smoldering. According to various sources, the fire has spread over a large area of woods 20 km from the buried reactor and near the nuclear waste burial sites. The waste from the Chernobyl catastrophe and other Ukrainian nuclear sites has been buried in the area since 1986. However, there is other nuclear waste in the area as well. 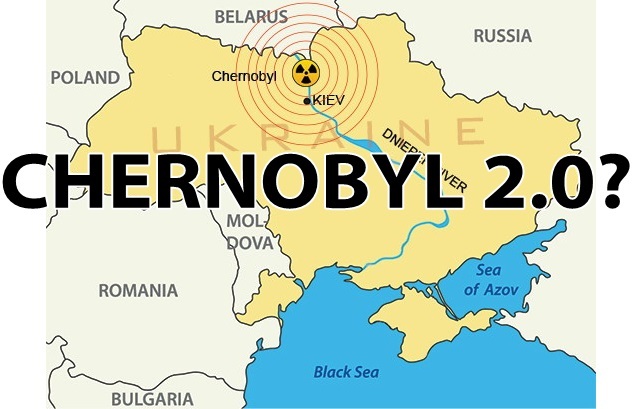 In 2014 I wrote about the new contract the Kiev junta signed with EU and US: according to this contract, Ukraine’s Chernobyl now serves as a burial ground for the West’s nuclear waste. In the country whose economy is shut and unable to perform its normal functions this is one of the few remaining ways to make money. For more read: Ukraine Scandals! USA Raids Ukrainian Gold and EU Sends Nuclear Waste. The problem with the fire in such area is that it re-awakens radio nuclides that have been dormant in the ground and trees all these years. Trees absorbed a lot of radiation from the Chernobyl catastrophe, saving enormous number of lives in 1986. The radiation thus awakened then becomes volatile, spreading with winds. If inhaled, the radiation is much more dangerous than the ground radiation. Some scientists go as far as suggesting that Chernobyl 2 is upon us. There is a lot of conflicting information coming out of Kiev. If true, localization of fire is a positive. Per Ukraine sources, the fire is still raging, but isn’t spreading. However, according to Greenpeace, there are 10,000 hectares of the radioactive Chernobyl forest that is presently burning. Greenpeace says this number is based on their analysis of satellite images. According to unnamed sources the fire has originated inside of one of the nuclear waste burial sites. RAW: Firefighting in radioactive forests of Chernobyl zone Ukrainian fire fighters reportedly managed to localise a massive forest fire close to the abandoned Chernobyl nuclear power station near Pripyat on Wednesday. There is a panic in Kiev and those areas of Europe that are likely to get affected. I am being told that doctors in Kiev recommend locals smear liquid iodine over their skin, drink iodine, and also drink vodka. On the other hand, experts are saying that the kind of radiation that is spreading through the air as fire and wind activate radio-nuclides cannot be helped by iodine. A better advice is to close windows and doors, avoid going out, and if you must, use respiratory masks. According to Kiev journalist in exile Yury Kot, the smell of smoke and soot has already reached Kiev, which means that the wind is presently blowing towards the capital, some 100 km south of Chernobyl. Politicians are already evacuating their children, while telling people that everything is under control. Yury Kot video in Russian. The difficulty is that today is May 1, or May Day, which traditionally was celebrated with parades and outings all over the USSR, and generally, the Russian world (elsewhere around the world, as well). Will it be allowed under the current junta is a question mark. On May 9th, many in Kiev were planning to celebrate the traditional Victory Day despite junta’s prohibitions and threats of physical harm. Will they still come out? Is it dangerous? Was it a deliberate provocation to sabotage celebrations? How is all this connected? Questions abound. If you recall, I did warn in January about the possibility of false flags or provocations related to nuclear stations in Ukraine. I also recently said in a reply to one of the readers that the Mother Earth is protesting against the humans’ treatment of herself, the Earth’s animals, and each other. Therefore, we get all kinds of disturbances from the Mother Earth. Unfortunately, Ukraine turned into an open-ended and unpredictable Pandora’s Box of disasters, just as I had warned. The only thing is a certainty: Ukraine will continue experiencing turmoil and disasters, unless and until the people awaken sufficiently, and the EU understands fully what they have gotten themselves into. But for that to happen Ukraine has to sink to the very bottom, so it could rise again. It appears there is still ways to go to reach that illusive bottom – so far it seems the fall of Ukraine is endless and bottomless. Although, I do notice first signs of awakening; it is happening, slowly but surely. Such things are impossible without extreme shake-ups. Remember my timeline for Ukraine: it is 2016-2018. We are still some time away from this timeline. See PREDICTIONS and OLIGARCH WARS for more. So far, the nuclear false flag many predicted materialized as burning radioactive forests around Chernobyl. But warnings about a possibility of another nuclear plant disaster (Ukraine has 4 in total), continue to sound. In Chernobyl it seems to be an act of God, or Mother Nature herself. Or is it? 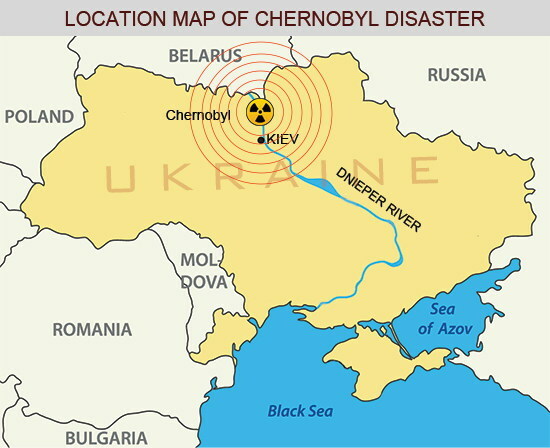 On the map, we can clearly see that Chernobyl is located close to the river Dnieper, flowing into Black Sea. If USSR didn’t contain ground water contamination, the entire Black Sea basin and at least part of the Mediterranean could’ve been contaminated. Interesting coincidence: last time Chernobyl woods experienced a fire was 1992, after Ukraine and Russia split up after the collapse of the USSR. let’s look at the map. Not only Kiev is next door, but Belarus, with capital Minsk, is right up there as well. If I were karma and wanted to send a powerful, or even shocking, message to humans that they are on the wrong path and that Russians, Belorussians and Ukrainians (or rather Malorussians and Novorussians) should stay together, this would probably be top of my list. The Chernobyl exclusion zone is located in the very north – northwest of Ukraine and just north of Kiev. Russian border is some distance to the north-east. Adjacent to this area is Belarus to the north. When Chernobyl disaster happened in 1986, the capital of Ukraine Kiev was affected directly, being located only 100 km south. Soviet leadership drew criticism at the time that they didn’t warn the Kiev citizens to stay indoors. As a result, hundreds of thousands in Kiev came out for the traditional May Day demonstration and festivities. I want to draw everyone’s attention to the fact that this fire happened on the 29th anniversary of the Chernobyl catastrophe. Coincidence? Some speculate that Kiev junta authorities set the fire deliberately in time for the first EU-Ukraine summit that just took place in Kiev (and to coincide with the anniversary of the original event) in order to compel the EU to give them more money for the construction of the new sarcophagus. But in the end, say proponents of this theory, Kiev could not control the fire they had started. The original sarcophagus built by the USSR in 1986 has been slowly weakening under the constant bombardment of radiation from within. Its term expired 10 years ago. Presently, the new sarcophagus is being built, to be completed in 2017 at the total cost of $2bln, but Kiev claims that they are still short of funds. The new donation from a pool of countries, including Russia, EU and others, is about 180 mln euros. Russia also just announced an additional contribution of 10 mln euros towards the sarcophagus construction: Россия даст Украине денег на новый саркофаг в Чернобыле. However, I would watch very closely where all this money is going. As I said in OLIGARCH WARS, unfortunately, Ukraine’s elites look at any money coming into the country as an opportunity to enrich themselves. According to the above-referenced Kiev journalist Yury Kot, Ukraine PM Yatsenyuk regularly writes off millions from the country’s budget, which then gets distributed between the top bras in Kiev in predetermined proportions. This is at the same time as millions don’t know what they will eat tomorrow. So, was the Chernobyl fire a deliberate action by the greedy Kiev elites? Are they crazy enough to play with radioactive fire? Considering Kiev closeness to the danger zone, I don’t think so. They are crazy, but not crazy enough to risk their personal well-being. Still, the 29th anniversary of the catastrophe is too much of a coincidence. It’s tempting to think that karma is starting to catch up to Ukraine and Kiev junta. Perhaps to a degree this is the case. Flashback: 1986 Chernobyl Catastrophe – the WHOLE TRUTH! In the ’90s I met a couple – engineers from Kiev, who came to the US with their two teenage daughters in tow. They told me that Chernobyl was the last straw, which eventually led them to emigrate. Some people in Ukraine, especially in Kiev, felt betrayed by Soviet authorities for not advising them on time of Chernobyl’s health danger. Once they learned about all the risks of Chernobyl, that couple made a quick decision. He stayed in Kiev and continued working to bring home bacon; she, together with their 2 children, moved to a sea resort in Caucasus. By 1989 they left the country and emigrated to the US. In defence of the Soviet authorities I must say that it was the first such disaster in history and they didn’t know exactly how to react. The traditional desire to keep everything calm and discreet to avoid panic, also made them delay going public. But look at how Japanese authorities behaved after Fukushima – not any better, and likely worse. Saving face is a big thing in Asian cultures and Fukushima presented an extremely embarrassing situation for the Japanese government and for the whole country. Trying to avoid panic and keeping tight control of what you say in public isn’t a surprising reaction by any government. Governments after all, consist of mere humans. In such open-ended and confusing situation any move will create a problem, and any action, or lack thereof, will draw criticism. You are damned if you do and you are damned if you don’t. But beyond that, this desire to keep things calm, discreet and appear in control is something embedded genetically in the Russian cultural code. It has to do with Russia’s role as the Global Balancer. See more about that in PREDICTIONS (I will also expand on that in the future Earth Shift Reports – stay tuned). However, if we look at the situation fairly, USSR did absolutely everything to localize the catastrophe and cap it quickly. Should they have kept public better appraised of their actions? Absolutely, they should have! In that case, there would have been fewer silly hoaxes and falsifications floating around… and who knows, the future of the entire country may have turned out differently. But this was a major lesson Russia had to learn – how to communicate with her own citizens and the entire world, not to mention how to promote herself and how to put her best foot forward. This education is far from complete, and Russia still draws lots of criticism in this department, but there is major progress. The stellar ability to communicate, promote, do PR and manipulate public opinion is the defining characteristic of the Anglo-American culture. In some ways, including this, the Anglo-American culture is a complete antipode to Russia. To illustrate how alien it was for Russians to promote themselves, or even to put their best foot forward, here is my personal story. When I arrived to the US in the ’90s, I was told I needed a resume. I had a very hard time trying to put all my achievements in the form of a resume, because to me it signified unnatural and embarrassing bragging. My American friends had a hard time explaining to me that it was how things were done in the US. You aren’t the only one, they said, all Russians have trouble promoting themselves. Once I managed to put that resume together, I went to an interview, after which I got a lucrative job offer the very next day. When I moved from CT to New York, I got a job on Wall Street within three days. I do think it was because of me, not because of what my resume said. I knew Russian scientists who were hired by phone, without any resume and with pretty limited English. My point is, there is a big difference between propaganda and the real truth. And the truth is this. Without any pomp or PR, in Chernobyl the Soviet Union managed to prevent the ground water contamination – a major heroic feat. If they didn’t, radioactive contamination could have spread as far as the Black Sea and Mediterranean. The Chernobyl reactor was capped and isolated in record time. Very few people know that not the entire Chernobyl has been closed down. Some of its reactors are still functioning, supplying part of Ukraine with electric power. USSR also tried to prevent the loss of life. In the effort to spare lives, one of the things the Soviet government did was purchase from Germany some very expensive robots for work in the reactor vicinity instead of people. The huge expense turned out a waste. Robots’ electronics stopped working from radiation, proving them useless. It became necessary to send people into the worst affected areas. The hoax I have seen floating around the West for years was that several million people died from Chernobyl. Let me just dispel this hoax right away. In fact there are so many BS hoaxes floating around, such as: Stalin killed 20 million in gulag (or, according to some ‘sources,’ it was more like 1/4 of all Russians); 20 million killed as a result of golodomor in Ukraine (holodomor, as they transliterate it incorrectly into English, which would mean in Russian ‘dying from cold,’ instead of ‘hunger.’). I have news for you: IF 20 million here and 20 million there were casually lost every few years in the USSR, there would have been no one left either in Russia, Ukraine, or Belarus. This is a statistical impossibility. The only true number as far as millions of victims is this: 27 million SOVIET citizens, primarily Russians, but also millions of Ukrainians and Belorussians, plus members of most other 100 nationalities, died as a result of Hitler’s aggression and WWII (aka, Great Patriotic War.) Period. End of story! This is the only number that is a true historic fact. This is why EVERY single citizen of the former USSR was touched by that war. Every single family lost someone and/or experienced extreme hardship. In terms of the USSR population of 250 million people – this is what the loss of 27 million means! Every single family was touched and experienced a loss!! There is a lot of confusion about all this in the West, but also in the post-Soviet space, particularly Ukraine and Baltics. It is important that those who are after the real truth, and not an expedient lie, understand one simple thing: for the past 24 years Ukraine (in addition to Baltics, Georgia, Poland, Romania) has been built up as anti-Russia on Russia’s borders. There are three forces that have been working hard on that: 1. the unified West, primarily US, Canada, Poland and Baltics, but Germany wasn’t far behind – all for their own ulterior motives; 2. western Ukraine ukro-nazis who want revenge on Russia after WWII defeat; 3. Ukraine oligarchs who control the media and who can only keep all the rich Soviet inheritance they managed to loot in the ’90s, IF Ukraine is separate from Russia. Ukraine MSM and politicians put out the numbers of 20 million dead from golodomor and several million dead from Chernobyl. Such inflated numbers were necessary in order to justify painting Russia as enemy and aggressor. These numbers were gladly parroted by Western MSM and history books. The story of all these forces meshing together becomes more and more interesting the deeper we dig. It is described in my new EARTH SHIFT REPORT: OLIGARCH WARS. You can read this report on LadaRay.info, where it is available for a donation. Read now! Here is my story about the ‘victims’ of Chernobyl. I did mention the family from Kiev I met in the US in the ’90s. These people are all alive and in excellent health, no one died from radiation, despite having lived in the nearby Kiev. But I have a better story. I grew up in Odessa, as many of you know. Being located over 500 km south, Odessa wasn’t affected by Chernobyl. We did have some people relocated from Pripyat’, Chernobyl’s satellite city, population 50,000. Most residents had been employed by the Chernobyl Nuclear Station. These were the people who were affected most directly; they lost everything, but they were evacuated pretty quickly. Other categories that were affected gravely were the first response policemen, firemen and large numbers of servicemen. Unfortunately, the majority of those who perished were Russian soldiers – it is traditional to send the army to assist with disaster remediation in Russia. However, within days (actually within hours) they started sending specialists. Those were people who knew how to deal with radiation, and my theory is that the nuclear energy specialists are actually less predisposed to radiation-related health damage. Call it natural selection – they go into this field because they are genetically capable of dealing with it. These people tend to incarnate for this purpose. I grew up two blocks from the famous Odessa Polytechnic Institute. The father of Space Exploration and Cosmonautics Sergey Korolev, who sent the first Sputnik and first man, Yury Gagarin, into space, was Odessa Polytech alumnus. See more about that in Earth Shift Report 2: UKRAINE: TRUE HISTORY. The Polytechnic Institute was also famous for its Nuclear Energy Department. Some of the best specialists were prepared there. As a matter of fact my older cousin Sasha was an alumnus. Upon graduation, Sasha abandoned the nuclear energy field, making a career in computer science and becoming the director of the Computer Data Division of the Moldavian government in Kishinev. But before that Sasha made ‘headlines’ when he rejected a very flattering offer to join the KGB (he was anti-establisment and anti-KGB at the time – weren’t we all when we were young). One of our family friends also attended the Nuclear Department of the Polytech. Almost as soon as Chernobyl happened, he enlisted as a volunteer specialist. We all were semi-worried about his safety, but everyone remembered the story how once he got drunk and fell from the third floor balcony. He got up like nothing happened, de-dusted himself and went home. It appeared that man’s guardian angel had to work overtime, but always managed to protect him from harm. There was a strict rotation schedule at Chernobyl and after a month or two people were sent back home, while the new crew would be brought in. That was done for obvious reasons: limit the cumulative radiation absorbed by one’s body. Our friend, after his term ended, volunteered to stay for another term. They did pay very well, after all. Everyone was yelling at him that he should go home, that he was really risking his hair and not having any progeny. Eventually he came home, got married and had children. Conclusions: millions dead from exposure to Chernobyl are a hoax. It’s not even hundreds of thousands. It was several thousand, possibly 10-15 thousand, if we take into account the unfortunate citizens of the nearby Belarus. Some people did get sick. They later recovered and went on with their lives. Yury Kot I mentioned above said he got hospitalized with radiation sickness back in 1986. Check out the video link with his interview above: he is still alive and looking good. In the comment I referenced above, I explained why losing millions again and again in the USSR, Russia or Ukraine would be statistically impossible. Do read that comment to fully understand my reasoning. To put it in perspective: 27 million dead in WWII meant that every single person and every single family in the 250 million people USSR lost someone, including devastating losses in my own family (see: Happy Victory Day, Fr. Merkel! My Open Postcard to the German Chancellor). Several thousand lost would look exactly how I am describing it here: I knew no one who died from exposure to Chernobyl, despite knowing personally several people who were there. Let’s return back to today. Should this fire not be extinguished soon, who will be affected most? Russians announced they were boosting radiation monitoring near borders with Ukraine in view of the situation. However, Russia isn’t in big danger. Besides Kiev, the other closest capital is Minsk, Belarus, which will celebrate both May Day and Victory Day with extensive parades and festivities. Another large city to the east is Kharkov (2 mln people). Warsaw is 650 km, Moscow 800 km, and Berlin 1,200 km away. The important thing to remember is where the wind blows in those parts. Presently, they say the wind is blowing south, towards Kiev. But usually, winds tend to blow north-west in that area of the world. This is what happened in 1986. That time, the biggest impact fell on Belarus, and after Belarus, on Poland, Baltics, Scandinavia and little on Germany. The multimillion Kiev and nearby central Ukraine were exposed as well. Of course, the further you were from the source, the less you had to worry. Will the wind continue blowing south, or will it change direction and begin blowing north-west? If Kiev fails to take care of the fire, Russians, Belorussians and possibly Europeans, may start sending their own helicopters and emergency crews. No one can afford another Chernobyl. This disaster is another proof of how incredibly incompetent the Kiev authorities are. This event will be another nail in their coffin. There are various scientific and conspiracy theories about what really happened in Chernobyl in 1986. As mystical futurist, I want to stress Chernobyl’s karmic and global significance. Conspiracy or not, it became the precursor and harbinger to the collapse of the USSR. I was a teen at the time, but I saw that connection from the beginning. The same year three shocking disasters happened that shifted the energy in the country. I remember thinking: poor Gorbachev, he just recently came to power and such events don’t bode well for his term in office. These events were: the Chernobyl disaster; first in many years train collision in which a large number of military personnel had died; the Russian Titanic – the Black Sea cruise ship Admiral Nakhimov drowned after being hit by a large cargo ship near Novorossiysk, leaving over 700 dead and missing (end of August 1986). Whether such events were human error or sabotage, one thing was certain. As USSR’s central power weakened, being questioned by the increasing number of people, terrible accidents and catastrophes became more common place. The number of catastrophes always increase during the times of sweeping change and tectonic shifts, such as the one we are experiencing today. They also increase when central authority weakens. What is happening in Ukraine today is characteristic of a massive shift. Ukraine is trying to re-define itself. They tried to live in a lie, but it didn’t work. They are now staring a catastrophe in the eye. So, is the fire an act of god and a karmic return, or is it enacted by humans? As I said, I don’t believe even idiots from the Kiev government are crazy enough to start such fire. But there is someone else in Ukraine who is. For the past several days I have been hearing an interesting story. When I put the two and two together, here is the picture that emerged. The infamous ‘right sector’ headed by western Ukraine Bandera follower, ukro-nazi Yarosh was financed by oligarch Kolomoysky. At one point in 2014 Yarosh, Kolomoysky and his right hand Korban became such buddies that the right sector’s headquarters even moved to Dnepropetrovsk, where Kolomoysky was governor. After Kolomoysky recently resigned, urgently flying first to Israel and then to the US, the right sector was left without financing. 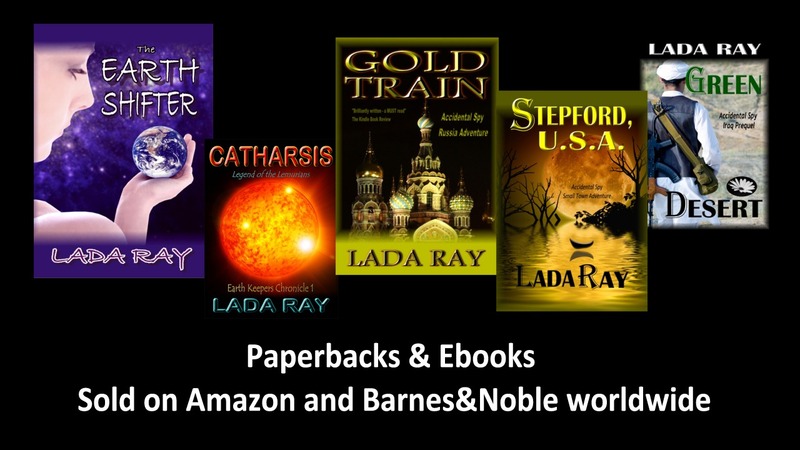 I describe this entire thriller-like story in detail in the OLIGARCH WARS. It is known that Kolomoysky left the country after having a heart-to-heart with US ambassador Pyatt. Since then, there have been persistent rumors that the right sector militants are being hunted down all over the country. Poroshenko is behind on executing the Minsk 2 agreements. Kiev is now being pressured by the EU to fulfil its obligations. At the EU-Ukraine summit in Kiev, Brussels reps told Poroshenko that Kiev has no chance of being considered for EU membership until they complete a list of EU demands. Poroshenko, unhappy with EU’s position, urged the EU to cancel visa regime for Ukrainians. The EU response: we can’t do that because Ukraine’s eastern border (where DNR and LNR are located) is controlled by Russia. If we open our borders to Ukraine, we are afraid that there will be uncontrollable inflow of Russians into the EU. Of course in reality EU is afraid of the uncontrollable inflow of Ukrainians, including armed nazi crazies – but blame Russia for everything when in doubt. EU also told Poroshenko that he really has to get a move on disarming any illegal armed units, per Minsk 2. This means the right sector militants have to either join the regular army or national guard, or disarm. DNR and LNR have been reporting that those ‘volunteer’ ukro-nazi battalions that are in Donbass tend to break the truce more often. They still shell peaceful citizens daily, despite cease-fire. DNR reports getting calls from Ukraine military asking them to join in the shelling of the positions of their own ukro-nazi volunteer battalions. So far DNR isn’t reacting to these pleas, being faithful to the Minsk agreements. Today, DNR reported that an unusually well-equipped group of what looked like Western special forces armed with non-Kalashnikov, Western made rifles, began an armed shootout with a group of ukro-nazis They killed 4 and loaded the remaining 7 into a Volkswagen van. After that, they left the area and the shelling of Donetsk had stopped. DNR intelligence reports that the intervention was executed by non-Ukrainians, possibly NATO or private contractor from the EU. These people were equipped with GPS-powered radios and other Western equipment. There are reports of the right sector and nazi battalion members being disarmed and hunted down in Dnepropetrovsk after Kolomoysky’s demise. What does all this mean? This means that the EU is serious about enforcing Minsk 2 agreements. It is interesting that the US, at least Obama personally, is on the same page. The scenario is playing out exactly as I predicted in my early article about striking parallels between the Georgia 2008 war and Ukraine 2014-15. Just like in the case of Georgia, US and EU first yell a lot and threaten to punish Russia. After a while though they realize that certain deals in world affairs are impossible without Russia. This concerns, among other things, Iran negotiations and the Yemen conflict. It also turns out they can’t deal with Ukraine without Russia either, as hinted by various EU and German officials. Another thing that scares EU are the unruly nazis running around with guns. This is a danger not only for Ukraine itself, but for Europe as well. And they are right. The EU reps told the following to Poroshenko in Kiev: ‘make sure Minsk cease-fire is observed. Don’t break the peace so not to give the chance to the Russian propaganda to malign us (with truth, apparently -LR). Also don’t you dare attack Donbass so not to give the opportunity for the Russian separatists to counter-attack. They are right to warn Poroshenko to behave. Head of DNR Zakharchenko warned that if Kiev breaks the truce and attacks again, there will be no Minsk 3. “This time, we won’t stop in Kiev; we’ll keep going,” said Zakharchenko. There is a real deal hunt for ukro-nazi militants all over Ukraine. This is undoubtedly sanctioned by the US and EU. In fact, in the Kiev euro-maidan coup both the peaceful protesters and vicious ukro-nazis were simply convenient patsies. They were needed to overturn Yanukovich and establish the dictate of the West in Kiev. Now they outlived their usefulness. They either have to fall in line or disappear. This repeats exactly the events of the 1930s in Germany. After coming to power, Hitler organized the ‘night of the long knives,’ eliminating his buddy Rem and his well-trained militants, first having used them for his purposes. If course Rem was getting out of hand threatening Hitler with his militants. Today, ukro-nazis also dare to threaten Kiev with turning their weapons on them, attempting at one point to storm president’s administration. Really, they never learn! The power in Kiev doesn’t belong to Poroshenko or Central Rada. The power in Kiev is concentrated in a different set of hands and in a different building. That’s why they can never succeed – the new maidan won’t be allowed by the puppet masters. And if they refuse to fall in line, they’ll never survive. As mentioned above, the entire spread is revealed in EARTH SHIFT REPORT: OLIGARCH WARS. Here is my scenario of the Chernobyl fire: having realised that they had been betrayed by the regime they brought to power, the right sector militants took revenge by setting fire to the radioactive Chernobyl forest. As mentioned previously, the fire started in one of the nuclear waste burial sites. This in itself is suspicious. The anniversary of the Chernobyl tragedy sends an additional message. Only ukro-nazis are crazy enough to risk contaminating Kiev and a big part of their country, with potential contamination of parts of Europe. They are not from Kiev – most of them are from western Ukraine, which is further to the west/south-west. If they killed peaceful citizens in Donbass, burned people in Odessa and tortured those who disagreed with them, why would they have any qualms starting Chernobyl 2? Is another nuclear event possible in Ukraine? There is persistent talk of a potential catastrophe on one of Ukraine’s functioning nuclear stations. Rumors of that are ongoing since last year. The good news is: the fact that so many people talk about it may have prevented such false flag. Another thing actively circulated is that the Kiev army is amassing forces to attack Donbass. The only question is when. DNR army spokesperson Eduard Basurin reported that DNR intelligence expects provocations involving heavy shelling on May 8th and 9th, to be blamed by Ukraine on DNR and LNR. What I want to stress is: people talking and yelling about it does help prevent provocations and false flags. There is ‘operation Glasnost’ underway. The goal is to make public and distribute in social media all the information that becomes available, thus taking away the real weapon of those who lie and manipulate. They can only succeed if the other side is silent. The more truth and warnings are pre-emptively released, the harder it is to execute false flags and perpetuate lies and hoaxes. There is also the factor of the quiet, behind the scenes Russian diplomacy. 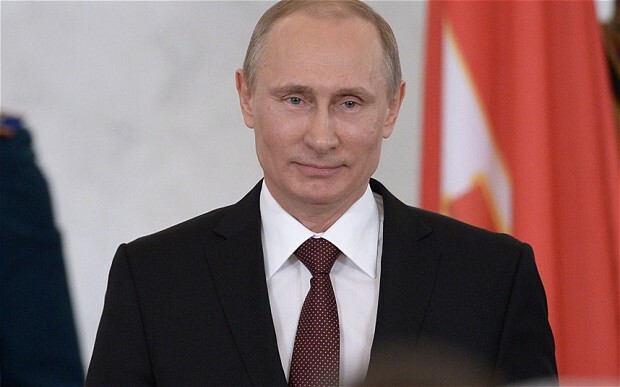 Russia can help geopolitically through a series of international levers available to her. Will Kiev make another attempt to attack Donbass? They may try, but they will not succeed. Moreover, every time they try, DNR and LNR will advance further, expanding their republics. DNR leader Zakharchenko announced that if any other oblasts of Ukraine want to join Novorossia, they are all welcome. At present, most military experts anticipate Kiev attack around June, but no later than mid-summer. I have not formed my opinion yet as the information coming in is very conflicting. There is a factor many of these experts don’t take into account. It is the EU, first of all, Germany and France. They continue putting pressure on Ukraine to fulfil Minsk 2 agreements. I anticipate that EU will have no choice but to continue increasing pressure on Ukraine to behave. Having done terribly throughout 2014, EU will have no choice but to try mending relations with Russia and to continue restraining Ukraine. EU, primarily Germany, will also continue putting pressure on the US. I know it sounds almost comical, but Germany does have some leverage. It is mainly moral, such as shaming US into observing certain rules agreed upon in the Western world. It goes like this: Merkel to Obama: if we do not stop Ukraine war, all these armed thugs will eventually cross our borders and destabilize our countries. You wouldn’t want that to happen, would you? Those sophisticated weapons you are sending them will eventually end up sold to ISIS or Assad, or a rogue arms dealer. These weapons may eventually be turned against US, NATO or EU. You wouldn’t want that to happen, would you? My prediction is that Merkel’s reasoning will work, actually. Basically, EU will now act as a restraining factor in relation to the US. This was the role EU should have played from the beginning of the Ukraine crisis. Instead they were one of the main instigators. Merkel is getting a lot of pressure from her own population, certain politicians, business, and increasingly, from some of the EU countries. We would usually mention Greece, Hungary, possibly Czechia and Slovakia here. I want to mention Bulgaria. I wrote about it previously. Bulgaria, being traditionally a close ally of Russia, to the degree that it was once called USSR’s 16th republic, has one of the most anti-Russian governments. Recall my story how McCain visited Bulgaria and the next day Sofia revoked its lucrative participation in South Stream. A Donbass journalist I know has visited Bulgaria recently for a conference. Many Bulgarians were apologizing profusely for the actions of their government, saying they feel like one people with Russians but that their government is completely under the US thumb and they can’t do anything about it. Obama is listening to Merkel, to the extent he is capable. In fairness to Obama, I have to say he is caught between crazies such as McCain who find war to be the best solution for any situation – and there is a majority of those in the US congress – and reality. Incidentally, behind the scenes Russian diplomatic efforts are proving very effective as well. They are delicately influencing and directing the situation. I can tell you one thing for sure. Ukraine is awakening and the energy is slowly changing, as predicted. I monitor people’s opinions throughout Ukraine. Here are a couple of eye-witness accounts from Dnepropetrovsk. One man says that in his circles people would hide rather than join the ATO. When the army of Novorossia arrives to Dnepropetrovsk, he says, 70% of men would join it to liberate the rest of the country. There is only one disagreement among his friends, he says: some believe we should separate from Kiev and western Ukraine and build our own Novorossia. Others say, why should we cede them the rest of Ukraine – we need to liberate it all, pushing them (meaning ukro-nazis and Kiev junta) out. It’s our country after all. Another man is the leader of the Ukraine Union of Soviet Officers. He says that they are all coming out for May 1 and May 9th, with their medals and uniforms, despite threats. But he also says that after Kolomoysky was removed as governor, Dnepropetrovsk started breathing easier, the right sector nazis disappeared from streets and people felt less threatened. Kolomoysky and Korban always portrayed themselves as saviors of Dnepropetrovsk, telling us it was quiet and orderly because of them. But they lied – after they left it got better. People are starting to awaken and question their reality, he says. Харьковчане, вывозите свои семьи! Филипп Экозьянц The Kharkov Partisans’ spokesman Philip Ekozyants warns Kharkov residents that they should move their families out of the city. When Kiev army starts retreating from Donbass, they will go through our city and we expect they will bomb the city. Men, move your families, but stay to help us fight to liberate our land. В ЛНР пойман агент СБУ, раскрыта схема работы наводчиц. Interview with Kiev SBU spy caught in Lugansk. He says his looks are very uncharacteristic of a spy and he can blend in. This is why he was sent to prepare for the arrival to Lugansk of 40 young women who would be Kiev junta spies. Among other things, the role of these female spies would have been to seduce Novorossia army soldiers, have them take these girls to frontlines and report their position so they could be shelled more accurately. Many points I have mentioned above are discussed in-depth in my new EARTH SHIFT REPORT: OLIGARCH WARS. It is a treasure trove of intel, history, revelations and new predictions about oligarchs, Ukraine, Russia and US (those who asked me for predictions about the US would find them in the report). If you haven’t read it yet, you are missing a lot! If you are one of those who want to continue reading free articles and listen to free videos, donating for my Earth Shift Reports is a great way to support my work, while also enjoying a very interesting and unique piece you won’t find anywhere else! Alternatively, you can also choose to donate here, either one-time or monthly. Finally, you can support me by buying my books. By reader request, we are looking into Bitcoin donations. Stay tuned! I will continue writing my articles and create new LadaRayLive videos for as long as I feel my readers’ interest and support! Thank you for your continued support!